Local Niçois musical combo The Kitchies has been touted as one of the top ten bands to watch out for this year – we can only but agree! 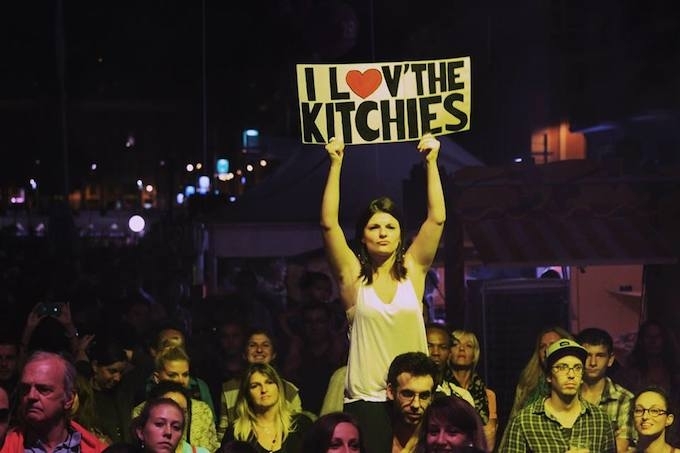 The Kitchies is a four piece group, all members being born, bred and resident here on the Côte d’Azur. They are Jonathan Lecoq (vocals, guitar), Jérémy Souillart (vocals, guitar, keyboards), Florent Gualandi (vocals, bass) and Yannick Scardina (vocals, drums). They met on the 20th September 2009, and a year to the date later, The Kitchies came into being when the guys went to Brighton for six months. Coming back to Nice in March 2011, they recorded their first EP “Time Square“, which was released in 2012.
Who or what do you consider to be your main musical influences? Where do the ideas for your songs come from? Our inspiration comes from our initial trip to Brighton and all the things that we have experienced in our time together. We also like to talk about what young people live through and the different ways in which they can grow and develop in the eyes of society. How do you get along together as a band? We are pretty much like a family since we spend a lot of time together; our shared experience in Brighton was really intense as we were living together as roommates for 6 months (Jonathan and Florent in a student room and Yannick and Jérémy in a flat). What is your favourite venue for gigs? Favourite venues played so far would definitely include The Haunt in Brighton (playing support to Dog is Dead) and the Montjoux Festival in Thonon les Bains (with BB Brunes and Skip the Use). But if you are talking about the kind of venue we would like to play, we love to play indoor venues (like the Nikaia Live in Nice) as they are more intimate and it is easier to communicate and form a bond with the audience. Vinyl is obviously better for the quality and richness of the sound, but we do prefer digital. We spend a lot of time far from home and it’s good to be able to listen to music whenever we want. Of course music is like a drug for us. We don’t think streaming is such a bad thing, even if we agree it is not fair to illegally download songs, but in our opinion and nowadays, it’s still a good way to expand our fanbase. For us it’s better to get more people listening to our songs even if we don’t earn a whole bunch of money from it. How has your music and style evolved over the years? Our identity really came about when we went to Brighton, and it has continued to evolve from there. Basically our music is English pop rock with a touch of Afro drums, and lately we have started to add some electro to our music with the use of keyboard and samples. What are the biggest challenges that you face as a band? The biggest challenge for us, and every band we guess, is to live with our passion. This year is also our first year as “Intermittent du spectacle“, which means that we have to play covers more than twice a week in restaurants and bars on the Riviera. That, and also rehearsing three times a week! What are The Kitchies’ plans for 2014? 2014 is a very important year for us, as we are in the process of recording our third EP which will be released sometime in March. We are also booking (on our own) a tour in France and England which will start in April. Basically this year we are looking for a booker, a promoter or a label who will find the gigs for us, which will free us up to focus on the music. We also hope to play some festivals this summer in France, England, Belgium, and Switzerland. Many thanks to the guys for taking the time out to answer our questions, and we wish them every success for the coming year. You can catch The Kitchies playing in Cannes at MIDEM Off and the Théâtre de Verdure in Nice this coming February.